Day of rest. Fast Sunday. Talked to my mother on Skype. Went to church. Took Matthew for a walk in the afternoon. Total of 12. Benjamin did 9, Jenny 2, Julia 2, Joseph and Jacob 3, William 1. Julia had some back pain from sleeping at the wrong angle. Jenny ran less to be fresh for AP Psychology which she took today. On Friday she is taking AP English Language/Composition test. 9 1:07:30.10. 7:30.01 With Benjamin. 3 24:53.10. 8:17.70 With Joseph and Jacob. Total of 12.5. Did a workout with Benjamin down the Provo Canyon. FIrst 3.5 - I got 19:56, he got 19:30. Then some jogging and a fast mile. He got 4:54, I got 5:14.8. Then a cooldown. He ended up with 10.5 miles. I ran 2 more with Julia. Last night we found out that Benjamin got a 4-year full-tuition scholarship to BYU on the condition of maitaning 3.6 GPA. He hopefully will not need 4 years given that he is currently a sophomore. This shows that a purely home-schooled 15-year-old student can go at least to BYU on a scholarship without ever obtaining a high school diploma. This is an important breakthrough - if not in policy, then at least in thinking. Many families that would otherwise be home schooling send their kids to public schools because they are afraid that colleges will discriminate against home schooled students with no credentials that can only come from some kind of an educational establishment. Our exprience shows this is not the case. Total of 12. Benjamin did 9, Jenny 4, Julia 3, Joseph and Jacob 3, William 1. Benjamin and I did a 2 mile tempo down the canyon in the freezing rain. Details below. 4.7 34:49.80. 7:24.64 Warm-up. Well, it started as a warm-up, but it became more of a cool-down as it started to rain. 1 2.000 11:00.80 5:30.40 I led through most of the first mile in 5:22, then Benjamin took over. I made it another quarter mile with him, and then I began to freeze and my legs and feet started feeling numb. I slowed down to 85 and 88 over the last two quarters which gave me 5:38 for the last mile. Benjamin managed 5:18 for the last mile finishing in 10:40. 2.3 17:46.40. 7:43.65 Death march to the house due to being completely drenched - as they say in Russian, like a wet chicken. Once we got there I changed clothes, and warmed myself up for about 30 minutes before I could run again. 3 24:10.80. 8:03.60 With Joseph and Jacob. Total of 13. Benjamin did 9, Joseph and Jacob 3, Julia 3, William 1, Jenny 4. 3 25:14.30. 8:24.77 With Benjamin, David, Joseph and Jacob. 6 44:57.70. 7:29.62 With Benjamin, David ran the first mile with us then turned around. 1 9:17.30. 9:17.30 With William. 3 24:51.70. 8:17.23 With Julia. Jenny took the AP English test today, so that made the run a little different that normal. She ran 2 miles. I did 12. Benjamin did 9, Joseph and Jacob 2, William 1. 7 54:25.10. 7:46.44 With Benjamin. 4 29:52.10. 7:28.02 Pushed Matthew in the stroller. Total of 20. Did a 6.25 tempo with Benjamin down the canyon starting at Vivian Park. He overcame his side ache issues and set a 10 K PR. Benjamin did 14, Jenny 4, Julia 3, Joseph and Jacob 3, William 1. Details below. 6.25 34:45.70. 5:33.71 Benjamin got 33:48, so around 33:36 10 K split gapping me by 57 seconds over the last 3.25 miles. I paced the first mile, then Benjamin took over. Our splits were 5:28, 5:27, 5:23 - that did me in, after than Benjamin ran 5:22,5:23,5:26. I did 5:40,5:41,5:41. This was a positive for both of us. For me I think it was the best tempo run of the year. For Benjamin this was a breakthrough in endurance - he overcame the side ache issue which started to concern me a lot - how in the world is he going to race the UVM Half if he gets a side ache as early as 3 going as slow as 5:30? 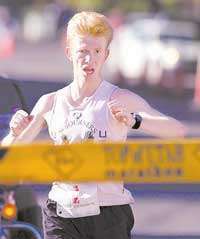 He also averaged 5 seconds per mile faster than he did over the first 6 miles of Phoenix and said he felt much better. We had 394 feet of elevation drop here, 1.2% grade, but we were at 5000 feet average for the workout. 4.5 38:11.20. 8:29.16 More distance with Benjamin - back to the house. 6 46:44.00. 7:47.33 Back to the car alone with a little detour to make it 20 total.